Last year, I made a vow to myself that I wanted to start creating more video content. So far I think I’m off to a good start and hope to be able to share at least one new video every two weeks! Today, I’m sharing how easy it is to roast red bell peppers. No need to buy them from the store — make your own in a matter of minutes. You’ll notice in my photos that the roasted red bell peppers are sitting in a liquid substance. This is not a liquid I put in the mason jar. It is simply the liquid that was released once the peppers went into the jar. It is a sweet syrup like liquid. 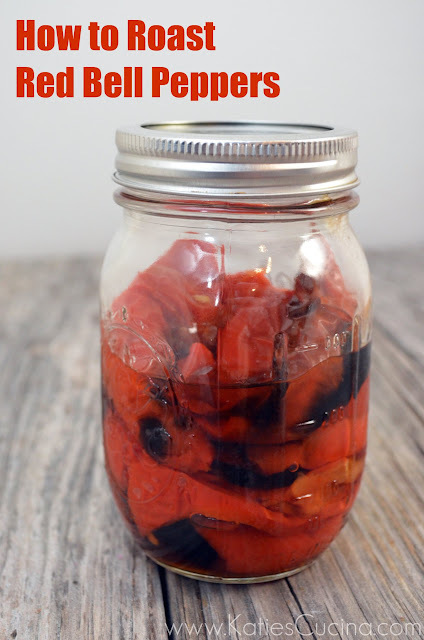 So, now that you have seen how easy it really is to make a jar full of gorgeous red bell peppers do you think you will give this a try instead of running out to the store the next time a recipe calls for it? While the oven is preheating rinse bell peppers, pat dry, slice in half. Remove the seeds and membrane from the peppers. Place the bell peppers cut side down on a baking sheet lined with either parchment paper or tin foil. Broil on high for 5-10 minutes or until the tops of the red bell peppers are beginning to char. Let cool for 10-20 minutes. Sliced in 1/2 inch thick pieces. Place in a mason jar and seal lid. Store in refrigerator for up to 5 days. Awesome video Katie!! My goal for 2013 is to do more videos as well – you are definitely an inspiration!! Love this. Thanks Liz! I filmed quite a few videos over the holidays, so now its just time to get editing! 🙂 Can’t wait to watch your videos as well! Thanks Rachael! I agree–no more buying them… make them yourself!!! Thanks for the quick and easy process. No problem! Glad I could help. If you don’t like the skins just set the hot peppers in a paper bag for a few minutes, remove them and the skin peels right off!